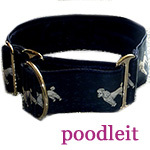 Poodle Blogger: Anyone for a Walk? Houdini obviously doesn't mind the hot weather, and will fetch his own retractable lead if needed in order to encourage his owner to get up early for the morning walk! Thanks to Rick Miles for this photo of Houdini. Taking photos of "Poodle joy" moments is Rick's specialty!